In today’s society, we’re conditioned to look forward. To anticipate and embrace new technology, and to strive for the latest and greatest of everything. Every so often, though, there’s no harm in looking back. Indeed, progress wouldn’t be progress without a means of getting there in the first place. And, at last, it seems like the car industry is catching on. For years, heritage was a taboo subject among car makers. To be seen to be looking back was to be seen as not progressive. Some, one notable example being Citroen, would baulk at mention of their past glories. The 2CV may have been a car that mobilised a nation, but it was also an old-fashioned tin umbrella with very little in the way of technical innovation, and that made it unfashionable. Today, though, manufacturers’ heritage cars are creeping out of the woodwork. The past, it seems, suddenly has relevance – even Kia has just restored an original Pride in recognition of its humble beginnings. There is one manufacturer, though, that has always bucked the trend when it comes to marking its heritage, and that’s Vauxhall. While some car makers are only just catching on to the value of past glories, the Vauxhall Heritage Centre marks its 70th anniversary this year. The first cars in the collection, a 1903 Vauxhall 3hp and a 1911 ‘Prince Henry’ are still there, tucked away in a corrugated steel warehouse at the back of the company’s staff car park in Luton alongside 70+ other iconic models from the company’s past, covering all bases from lowly Novas and Vivas through to a VX220 Turbo and a V8 Monaro VXR. It’s a fabulous collection, and one that encompasses many of Vauxhall’s own innovations. This was the company that gave us the world’s first sports car (Prince Henry) and fully-integrated monocoque (H-Type) – not a lot of people know that. They get used, too. Almost every Vauxhall media event will have some Heritage Centre presence, with a direct correlation to the brand’s modern cars – most recently, the collection’s V6 Omega alongside the new Insignia. The message? That the Insignia has climbed the ladder and is now a more premium car, rather than a direct descendant of the Vectra and Cavalier. Presiding over the Vauxhall collection are two stalwarts of Vauxhall themselves, Andy Boddy and Terry Forder. The pair both joined Vauxhall as apprentices in 1979, so have been with the company longer than many of the cars in the collection. They’re among some of the most gifted engineers in the company, too. Equally at home playing with carburettors and magnetos as they are modern ECUs and fuel injection systems. 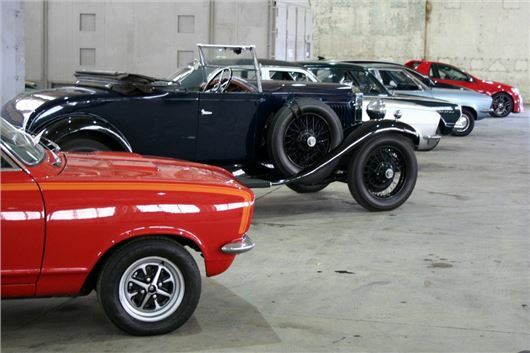 Their most recent project has been the restoration of a Viva GT, a nuts and bolts concours job that follows on from similar renovations on a CA van, HP Firenza and PC Viscount, restored in the colours of Vauxhall’s old directors’ cars. There are other companies that have impressive collections. Ford, for example, has some wonderful vehicles tucked away under Dagenham’s arches. But the Vauxhall collection is unique in that it has been part of the company’s public affairs department since its inception back in 1947 and has always been used to promote the company. Our pictures come from the 2017 ‘Griffin Greats’ celebration, where the company threw open the doors and let many of its cars get driven in anger. It does them good, both the cars, and the Vauxhall brand.